Now you can connect the "original" blue and white SC-2000 Stampcreator system to your computer's USB port or USB hub (new black and silver systems are already USB compatible). 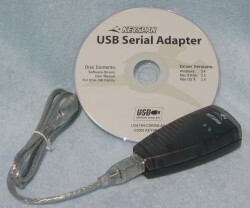 The serial output on the Stampcreator connects to the adaptor, which then plugs into your laptop, notebook or desktop computer. Works with PC and Mac systems. Simple installation, drivers are included. This special adaptor has been thoroughly tested with the Stampcreator system and allows universal connectivity.